What’s Happened to Our Beach? There’s nothing quite as peaceful as walking across Palmetto Boulevard, over a sandy beach access and down onto the beach. The sound of crashing waves rushing in and out can be heard before the water is even visible. It’s something visitors look forward to as they come back to Edisto Beach year after year. However, this year, something is a little different. If you’re not lucky enough to be staying on front beach then you might not notice right away that there has been some significant erosion all along our coast. Some signs are posted at beach accesses that have undergone the most erosion warning of a steep drop off, but these signs don’t really do it justice. So what is this steep drop off the signs are warning beachgoers about? Essentially, it is nothing more than erosion. In early May there was a small storm that brought with it significant wind, which, in turn, caused the surf to be exceptionally strong. The storm surge carved out much of the sand just below the sand fencing that, up until now, had been working nicely to build up some of the dunes along the beach. Now, however, much of the newer sand fences have been destroyed. Down around the point, many walkways, staircases, and benches have been destroyed. All of this is a natural part of beach life; storms come and go and people rebuild. Luckily, no significant damage was done. One of the worst parts is with this erosion it makes it interesting to get down onto the rest of the beach. If you’re like my dog, you’ll just jump down (it’s about four feet high in some areas). If you’re like me, you’ll find the lowest spot and attempt to ski down it with flip flops. Keep in mind that there is still plenty of beach in most areas, even during high tide. Just be aware of the erosion in case you have young children or anyone who needs assistance walking because the beach is a little tricky in some spots. 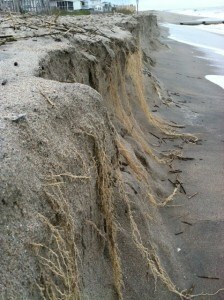 Remember that even with the erosion Edisto Beach is still the best beach in the world. Be sure to keep off the sand dunes and out of the sea oats so that these areas remain protected. Just wondering if this erosion is found in the state park part of the beach also. Have any of the camp sites been compromised?